Dragon wedding rings are a unique and exciting style couples can share to express not only their love and unity, but also their powerful personalities and confidence. 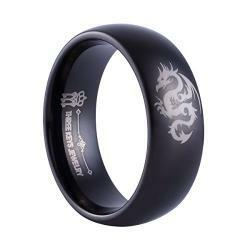 With many styles available and much symbolism behind them, dragon rings are growing in popularity with many couples. Dragons are powerful figures in fantasy and mythology, and there are many types of dragons portrayed in popular media and literature, from simple lizard-like dragons to dominating medieval creatures to fierce yet benevolent Asian dragons. Dragons symbolize power, confidence, protection, and longevity, qualities that are also suitable for a marriage. In certain cultures, dragons have additional symbolism, such as the lucky quality of protective dragons in Chinese and other Asian cultures. Depending on how the dragon is portrayed, it can also be considered a symbol of wealth, prosperity, and personal power, all of which are desirable in a marriage. Figural dragon designs that are carved or etched onto the ring. Dragons designed to curl about the finger. Dragons in action, such as flying or breathing fire. Parts of dragons rather than whole beasts, such as claws, skulls, scales, or eyes. Designs that incorporate Celtic weaving or runes for additional symbolism. Gemstone rings with the gem as the dragon's eye, being clutched by a claw, or encircled by the dragon's body - amethyst and garnet are the most popular gemstones used. Different styles of dragons, such as Asian, tribal, fantasy, gothic, or simple creatures. Multi-tone rings that highlight the dragon design with different metals. Depending on the specific retailer, ring design, materials used, and other factors, the cost of dragon rings ranges from less than $30 to more than $100. 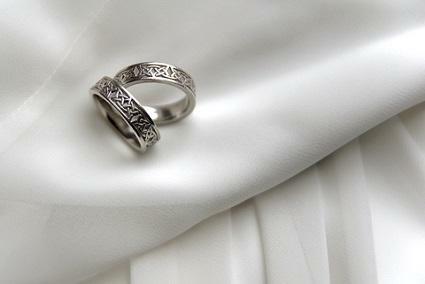 Shipping and customization fees must also be considered as couples are pricing their wedding rings. Trends: While the alternative design with a dragon may be appealing now, it may be less attractive after celebrating many anniversaries. Ring Sets: Because most dragon rings are highly detailed, they can be difficult to match to an engagement ring and it may be impossible to wear the rings as a set. Ring Care: The minute carvings and details of a dragon ring can be difficult to keep clean and free from damage. Furthermore, because many of the rings are made from softer metals, the details may eventually wear off when the rings are worn daily. Dragon wedding rings are highly symbolic, beautiful choices for a couple interested in unique alternative wedding rings, but they aren't right for every couple. Choosing a design carefully after considering the drawbacks, however, will ensure that couples not only have rings they enjoy on their wedding day, but that they will continue to treasure those rings for many happy anniversaries.